Freddy Diaz Garcia, age 16 is the brother of our Nica child, Noel. 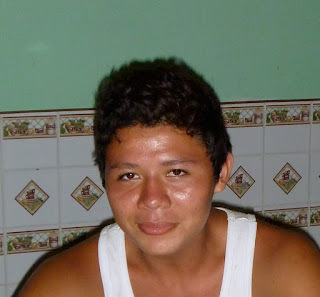 We were introduced to Freddy in December, 2011 when we visited the Remar facility in Managua. He did not spend time with us during the visits, but I always noticed that he longingly watched us from a distance. The boys had been separated for approximately 2 years as a result of Noel being transferred to the Leon facility. Very early in the morning on the 1st of April, Noel came into our room as we were just beginning to awaken. He was very upset, we told him to climb into bed while he told us what was bothering him. He had gotten a frantic phone call from his brother saying he was running away. We had no other details and no information as to his whereabouts. Freddy had borrowed a cell phone to make the call and hung up promptly. There were many calls to old friends in Managua trying to get more detail before Freddy called us back. We got an exact location, told him to stay put and we would come get him. By 9AM, Preston was out the door with Engel and Noel heading south beyond Managua to find Freddy. They traveled on 3 different buses to get to their destination. Time was of the essence because Freddy was alone on the streets with no money and no belongings AND it was a Sunday. They needed to get back into Managua by a certain hour to ride the bus to Leon in order to catch the last bus in Leon to our residence. It was a relief to see all the guys walking up the road to our home at dusk. I opened the gate to let them in and the first one through the gate was Freddy. He greeted me with a big hug, at the same time telling me "Thank You". It was a joyous occasion in our home that night, Freddy and Noel together again after more than 2 years. The boys laughed and talked for hours before we insisted that lights had to be turned out. Noel and Engel shared clothes with him because he had nothing but what he currently wore. The next morning we went to the market to buy shorts and underclothes. These 2 brothers have been through a lot in their young years. They were placed in the Remar facility by the Family Services before the boys were 10 years of age. They had been found wandering the streets in a mountainous town, living on their own. We are happy that we can provide them a safe place to live within a home atmosphere. It is important that they remain together and not be separated.